One of faction / tribe combinations that is never really talked about or discussed in Shadow Era is the Shadow Homunculus. There is a real strong synergy within the tribe dedicated to ally growth, discarding, and manipulates card from your hand and graveyards. Here is my homunculus Gravebone build. I would equate this to the shadow version of the Aramia wisp decks. With ally growth being the primary win condition of this deck, Voracious Arachnid and Evolving Abomination become the key allies since they have the most growth potential of the tribe. 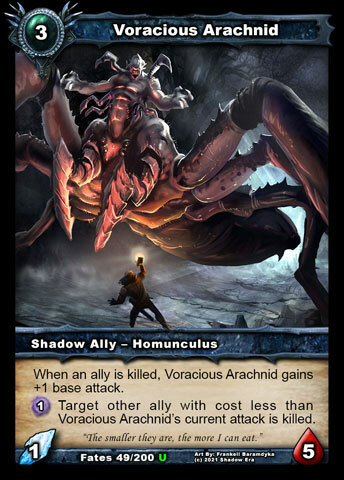 Voracious Arachnid is the go to ally for the early game. He has high starting health and with the assistance of Abomination Factory and killing things he can grow quite rapidly. He is also able to potential deal with 2 targets, and bypass stealth, so this makes him a very real threat as soon as he hits the board. Evolving Abomination is a great complementary strong ally to Voracious Arachnid. If both are on the board, Voracious Arachnid usually is the first to go because Arachnid grows when anyone’s allies die and he can deal with 2 targets. You can attempt to bait opponent, by buffing Evolving Abomination instead of Arachnid to make his the more immediate threat. The upcoming balance changes for 2.870 is actually a great buff for Evolving Abomination and makes more sense too as you have to play allies to win. The deck is very lite on Abilities which will lead to more aggressive attack growth. His main source of health growth will come from Abomination Factory and/or Plightbred Runt. 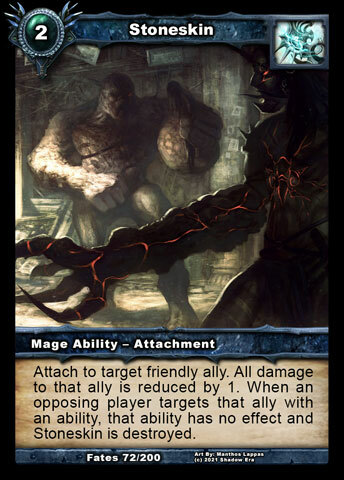 Being that the growth is only dependent on what you play, opponents relying on cards such as Crippling Blow and Captured Prey could find themselves very upset when you remove any negative attachments with Shriek of Revulsion. Abomination Factory is the centerpiece for the tribe. Even if I have an ally to play on turn 2, I still prefer to play for setup with Abomination Factory. This opens up the options for your turn 3, which should ally be an ally, preferably Voracious Arachnid or Evolving Abomination. You can combine Abomination Factory with Plightbred Runt or Brimstone Devourer depending on how you want to attack the board. Plightbred Runt is primarily discard outlet, with the rare occasion to be played onto the board typically to disarm a trap. When Plightbred Runt is discarded he helps your entire board grow, and if combined with Abomination Factory, 1 friendly Homunculus ally can grow +2/+2. 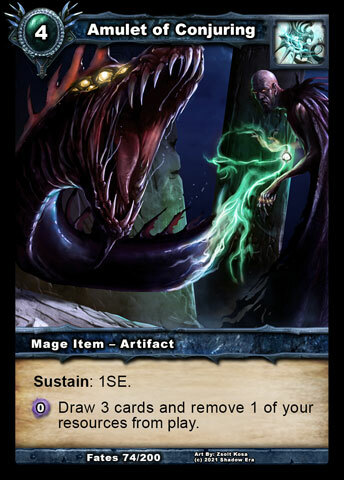 Brimstone Devourer’s primary use is also as a discard option. His 3 damage from being discard is a great pseudo spell, that does not affect the growth of Evolving Abomination, and give you an option to deal with stealth allies, who typically tend to have low health. Brimstone Devourer has a bit more flexibility than Plightbred Runt in that he could he can be consider a target of a Gravebone revival. What’s that you say? Well early in the game he will likely be the primary discard option to help control the board while you are setting up. If you are in a good position, timing a revival with a Plightbred Runt discard can accelerate the growth of Devourer because he is after all a homunculus ally. Typically he is my 4th option for revival, except early game where I can further progress my board dominance. Falseblood Cultist happens to appears in almost all of my Gravebone decks, but in this case he is used a bit differently. Typically with Gravebone you will want to discard a fatty and revise him with the Hero ability, but in this case he the non-growth discard option (to Ab Fact) and secondary draw option (to Amulet). This provides a nice bit of flexibility in your game plan in case one of the primary pieces is missing or have been removed by opponents. Normally in everyone of Gravebone decks I run Fireball. 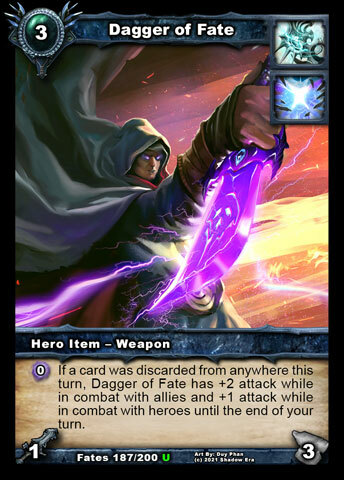 With the Homunculus tribe I opted to try and use Dagger of Fate instead. The benefits of the switch are that Dagger of Fate vs Fireball can deal more Damage over Time (3-9 damage), is not blocked by Fire/Ability immunity, and can help beat down weapons/armor. With the mass discarding that will occur your more likely to maximize the damage Dagger of Fate can achieve each turn. The deck is basically a house of cards. You have extremely powerful pieces that are very synergistic with each other, but if you remove 1-2 of those pieces, it can be really hard to recover. The main reason is that the deck is running on low resources, low SE, low hand cards, and your board generally consist of 1-2 allies that you have invested a lot of cards and growth into. These investments must be protected and Mages have access to quite a few options. Cinderborn Familiar is a much needed ally for the tribe acting as a protector to a variety of cheap abilities. He reacts in a more preventative “trap” like way, however a skilled play can work around him. Additionally Cinderborn Familiar is a homunculus ally so he can be used to fuel Abomination Factory, and he can also be targeted for growth in the right circumstance. 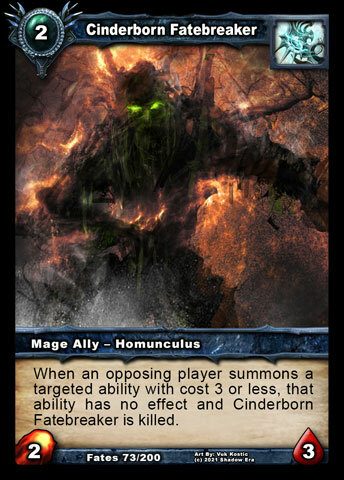 Shriek of Revulsion is the other needed piece, when Cinderborn Familiar was unable to block a negative attachment such as Crippling Blow or Captured Prey. Normally in my Gravebone decks I prefer sac lamb for these guys, but with all the investment you put into them. you get a better return from simply “freeing” these guys. This is especially true because allies like Voracious Arachnid and Evolving Abomination have the potential to grow overtime. With the recent balancing changes in version 2.86 there’s a bit of a shift in the deck and how it plays. Been running a bit of a variation lately which give the deck a bit more power. 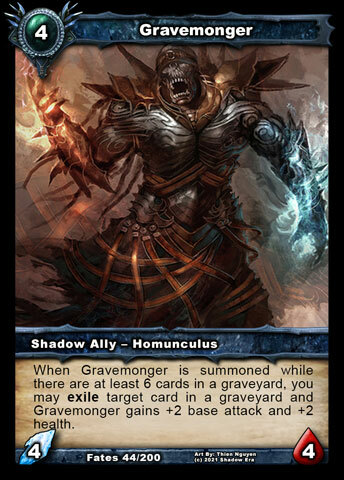 Gravemonger has actually been a really powerful ally. I have found that Gravebone’s hero ability has pretty much been a one time use because of the Shadow Energy drain of both Voracious Arachnid and Amulet of Conjuring, so playing from the hand is more beneficial. By the time you would normally play SF, you typically have six or more cards in the graveyard, which allows Gravemonger to meet his buff summon condition, so he comes in as a 6/6. You can use Gravemonger to sort the top of your graveyard if desired for use with Undying Bond, or you can target items/abilities which no longer have any use to you since they are not able to be recycled. When summoning Gravemonger, you can also combo discarding Plightbred Runt with Abomination Factory, and Gravemonger can come on board as an 8/8 which is extremely powerful for 4cc. With the new change to Amulet of Conjuring you can draw lots of cards which is really needed to complement the hand dump from mass discarding. It also helps to dig through your deck to find those key cards to combo with Abomination Factory. I decide that 3 copies is plenty, because I want to try and have a draw that was able to retrieve allies that are good for discarding (Plightbred Runt and Brimstone Devourer). Undying Bond is what I choose because it will give me two allies. If I have Abomination Factory in play you can combo these allies right away, same as when digging your deck with Amulet of Conjuring. Shadow Knight Also does a similar thing and puts a body on the board for you, but I was looking for more ammo and Undying Bond gets me more of what I need. Stoneskin is actually a really good complimentary piece for the Homunculus Tribe and Cinderborn Familiar. Both are awesome for protecting your other allies that you have invested growth into, and both provide a different (but similar) kind of protection. Cinderborn Familiar at times become food for Abomination Factory, so Stoneskin provides that additional alternative protection. When both are on the board at the same time, they will check down based on Standard Resolution Order (SRO). Check down occurs left to right, so if you have Cinderborn Familiar far left and a Voracious Arachnid with Stoneskin attachment on the far right of your board, when an opponent plays Fireball targeting Arachnid, Cinderborn Familiar will react first and die leaving Stoneskin in tact on Arachnid. Tagged discard, Gravebone, Homunculus, Sf, Shadow era, shattered fates, tribe. I am glad that you like it. I would be interested to know what type of adjustments you make and how they work out. I like testing different things to see how they work. New change to evolving abomination should buff the deck too. I have so many foils it would be a sin not to use them!! I hope they make Evolving Abomination sleeves for me to go with my abomination factory playmat! Love it. Pure and fair aggro build.